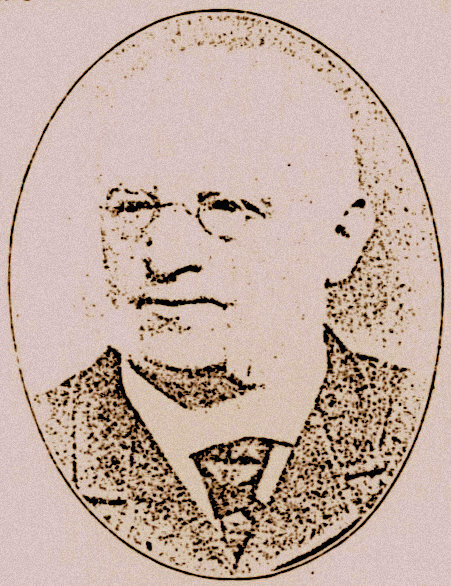 “The present excellent condition of many eleemosynary Jewish institutions in San Francisco is due to an appreciable degree to the precept and example furnished through the noble and useful life of August Helbing. August Helbling was born in 1824, in Munich, Bavaria. His father was court jeweler to King Ludwig I. Due to this royal connection, the 14 August children were able to have complete educations. August Helbing graduated from industrial school (Gewerbeschule) with high honors and was then apprenticed to a mercantile house, where he developed a fine knowledge of business. German politics drove August Helbing and his lifelong friend, Moritz Meyer, to the United States. After a short period in New Orleans, Helbing headed to San Francisco via the Isthmus of Panama. In company with Moritz Meyer and August Wasserman, Helbing arrived at the Golden Gate in 1850. There, he helped found the dry goods company of Meyer, Belbing, Strauss & Co. In 1860, the business was changed to crockery, and the name changed to Helbing, Strauss & Co.
A stockbroker firm was organized, and eventually an insurance firm, with Helbing, Strauss, and Jacob Greenbaum as partners. August Helbing was deeply involved with the establishment of the early San Francisco Public School System. 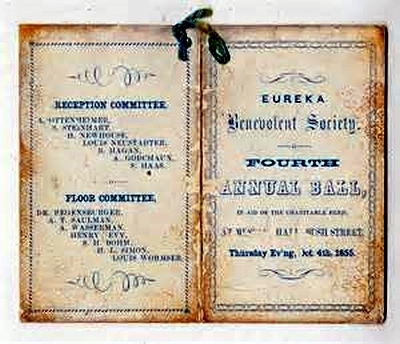 August Helbing was a founder of the Eureka Benevolent Society, where he was elected as its first president in 1850 — the same year of his arrival in San Francisco. Besides helping needy Jews and others, the Society functioned as a social club for it members in its early years. Today, it is know as Jewish Family Services of San Francisco. In 1860, August Helbing married Miss Frances Koenigsberger. Together, they had 4 children: David, J.A., Mrs. I Blum, and Mrs. R. B. Rothchild. August Helbing passed away in 1896, as did his wife, Frances, a few weeks later. David Epstein is curator of this August Helbing exhibit. Hebrew Ceremony — One of the most solemn and impressive ceremonies of the Hebrew faith was performed yesterday at the Albion House, in the family of Mr. Keesing. Dr. Zachariah officiated upon the occasion. At the same time, we understand, a Jewish Benevolent Society was formed. As there are many enterprising and useful citizens of the Jewish persuasion in our community, we have no doubt that this society will be a large one, and that ere long we shall hear of the establishment of a synagogue in San Francisco. —Daily Alta California, San Francisco, June 14, 1850 [WSJHQ 4/1]. Mr. and Mrs. Barnett Keesing arrived in San Francisco in 1849 from Australia, and on September 26 attended Yom Kippur Services, the first Jewish religious services held in the West. One report has it that Mrs. Keesing was the only woman present. She was eighteen years old when the bris reported above was performed. In 1850, Barnett Keesing owned and operated the Albion Hotel on the corner of Jackson and Dupont Streets, where he provided “board and lodging, $15.00 per week.” Later, Keesing was successively a clothier, grocer, seller of pre-fabricated wooden homes from Australia, and had a real estate business in San Francisco. 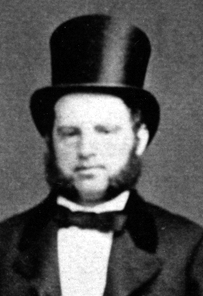 His motto was, “if you have land, you have everything.” The Barnett Keesings were charter members of Congregation Sherith Israel, San Francisco (1851). Much later, Mrs. Keesing was a member of Congregation Emanu-El. 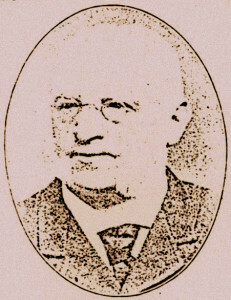 The Keesings had eleven children.